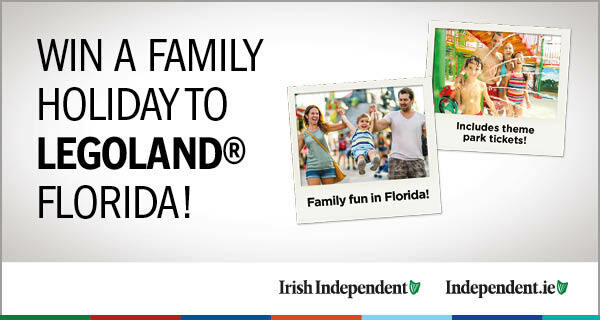 Win a family holiday to LEGOLAND® Florida! To celebrate the release of The LEGO® Movie 2, We are giving you the chance to win a family holiday to visit The LEGO Movie World at LEGOLAND® Florida Resort. To enter, complete the form below along with the unique code found in the Irish Independent between February 9th and 18th. The LEGO® Movie 2 is out in cinemas February 8th! amazing prize includes flights, on-site accommodation, transfers and 2-day park tickets. To enter the competition, fill in your details along with unique code found in the Irish Independent between February 9th to February 17th or complete entry form printed in paper and post to LEGOLAND COMPETITION, PO BOX 11,INDEPENDENT HOUSE, 27-32 TALBOT ST., DUBLIN 1. Closing date for receipt of entry is strictly Wednesday, February 20th. The competition runs from February 9th to February 20th until 11.59pm.